Italy 2010 regional elections, turnout down: that’s the cause! According to some surveys, compared to previous regional elections of 2005, yesterday at 22 0’ clock we had almost 9 percentage points less of voters, that relating to 41 million potential electors, is about 3 million and seven hundred people. Waiting to see how this figure will change after the polls closing, when we’ll more carefully examine them, even if this will be the number, the Italian world of politics will once again have an issue to watchfully analyze. I am the Italian politician. I am a politician in the sense that I apply to elections, not because I am interested in the art of governing the society or just to be pedantic, the administration of the polis - the city - for the good of all. Don’t lose your time with easy demagoguery. Come on, let’s be serious. I am Right, Left and even Centre, if it’s necessary. I am here to defend Berlusconi or send him home for at least fifteen years. Whatever you say, our President of Republic always shows great balance and a sense of the State. Whatever you say, His Holiness the Pope always shows great balance and a sense… of the State. Of course I’m talking about the State of the Vatican, but also our Italian State, they're the same thing. I call you all to vote. It’s one of your sacred duties, because you are in a democratic country and the vote is what sets you free. And once you vote, you are free. I am referring to you, that have not yet taken your precious ballot to go at the polling station and do your obligation. Some may suggest that among the reasons there is the further increase of unemployed in 2009 compared to last year: 380 thousand people. That’s the usual defeatism, a premature and unwise analyse. Someone else can bring the higher prices, which this year are estimated at about 700 euros per family. It would be a superficial and immature explanation. 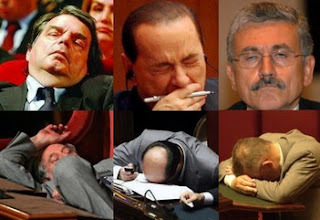 Some people prefer to blame the government, accusing it of having worked so far almost exclusively with public and private affairs of Silvio and those who impute liability to his opponents, who over the years have not done enough to prove of being really alternative to the party of Prime Minister. All this shows a dangerous indifferent drift, that’s the true problem of modern democracies. There may even be someone who once again speaks of our salaries, the highest in the world. It would be a symptom of the worst enemy of our and your company: the anti-politics. In this difficult moment for all of us, we are obliged to tone down the confrontation and fight the common enemy together. Because the enemy should be common, otherwise it divides us. If something is a problem for you but not for us, why should we be interested in it? That's why the real culprit of the decline in turnout in elections is only one: the Daylight saving time! Yes, the daylight saving time, that Sunday and today morning waked us up an hour before and at the same time took us away a precious sleeping hour. The News: Regional Elections in Italy: the candidates and how to vote.